Running for 23 minutes this next film marked Elliotâ€™s slow venture into colour and the establishment of much more complex, longer and dynamic plot structures. While still utilizing the use of a narrator to drive the story, his animation became more dynamic and the story lines more complex. This film was made back at his father’s storage facility and was the first time Elliot has substantial assistance from a full time producer, Melanie Coombs, and two model making assistants, Michael Bazeley and Sophie Raymond. He also utilized the mentoring skills of Darren Burgess, a experienced animator from Adelaide. The film took over a year to shoot on a modified super 16mm Bolex and was the first time Adam utilized new digital software that assisted in the viewing of captured frames. On average Elliot shot between 5 and ten seconds of footage per day. The budget to the film was $380,000 AUD; it was narrated by the Academy Award winning actor Geoffrey Rush with character voices by Kamahl, John Flaus and Julie Forsythe. In 2004 the film won an Academy Award for Best Short Animation and has played at over 100 film festivals and won over forty major awards. In 2005 it was named as one of the top 100 animated films of all time by the board of the world’s largest animation festival in Annecy France. Funded by the Australian Film Commission and SBS Independent, this short explores the childhood memories of Elliotâ€™s brother. In several interviews Elliot has stated that it is his most factual and autobiographical film and that the Brother is in fact himself. Brother marks the height of Elliotâ€™s minimalist approach and aesthetic. He made it in a friendâ€™s spare bedroom above a falafel shop in the bohemian inner city suburb of Fitzroy, Melbourne. Elliot set strict rules for himself: the film should be made in a completely analog fashion using a limited amount of tools and equipment. In keeping with his purist ideals, he edited it on a Steenbeck, rejecting the offer of the use of a computer. Like the two previous chapters of the trilogy, Brother was narrated by William McInnes. It traveled to many international festivals, winning Elliot two AFI Awards: one for Best Australian Short Animation and one for best Australian Short Screenplay. The budget for Brother was $52,000 AUD. Made in 1997, Cousin was Elliotâ€™s first professional film funded by the Australian Film Commission, SBS Independent and Film Victoria. As with Uncle, Elliot chose a minimalist approach and a spare narration to drive a very simple remembrance of a childhood relationship he had with his cousin who has Cerebral Palsy. Like Uncle, Cousin has a greyscale palette but was shot on color stock. This technique allows the use of spot color to heighten the significance of specific objects in the film. This device is common to all of Elliotâ€™s work, which he sees as a homage to the spot red effect that Steven Spielberg used in Schindlerâ€™s List. This film was shot in a small storage unit in the outer suburb of Moorabin in Melbourne at a facility owned by his father. This time Elliot employed AVID digital equipment to edit the footage shot on 16mm film. Cousin has been shown at many film festivals and won Elliot his second AFI Award for Best Australian animation. Narrated again by William McInnes, the budget for Cousin was $42,000 AUD. Made in 1996, Adam Elliot’s first short film was created at the Victorian College of the Arts. With a running time of six minutes Uncle won numerous international awards including an Australian Film Institute Award for Best Australian Animated Short. The film was shot with a 16mm Bolex camera using completely traditional stopmotion techniques, and edited on a Steenbeck. The budget for Uncle was approximately $4000 AUD. From Brown Bag Films, Give Up Yet Aul Sins is based upon the 1960s recordings of young children telling Bible stories in a classroom to their schoolteacher. Nominated for an Oscar and for a BAFTA award, Jasper Morello is a short feature made in a unique style of silhouette animation developed by director Anthony Lucas and inspired by the work of authors Edgar Alan Poe and Jules Verne. The Tell-Tale Heart is a 1953 American animated short film directed by Ted Parmelee and narrated by James Mason. The screenplay by Bill Scott and Fred Grable is based on the 1843 short story of the same title by Edgar Allan Poe. The film was the first cartoon to be rated X, indicating it was suitable only for adult audiences, by the British Board of Film Censors. It was nominated for the Academy Award for Best Animated Short Film but lost to Toot, Whistle, Plunk and Boom from Walt Disney Productions. In 1994, animation historian Jerry Beck surveyed 1000 people working in the animation industry and published the results in The 50 Greatest Cartoons: As Selected by 1,000 Animation Professionals, in which The Tell-Tale Heart ranked #24. In 2001 the United States Library of Congress deemed the film “culturally significant” and selected it for preservation in the National Film Registry. The short is included as a bonus feature on the first DVD release of Hellboy. 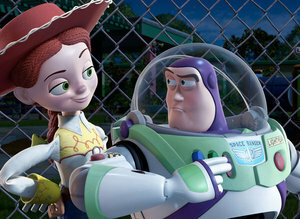 Toy Story 3 Director Lee Unkrich and screenwriter Michael Arndt join NPR’s Terry Gross for a 37 minute discussion about the Toy Story trilogy, coming to DVD and Blu-ray Disc November 2.